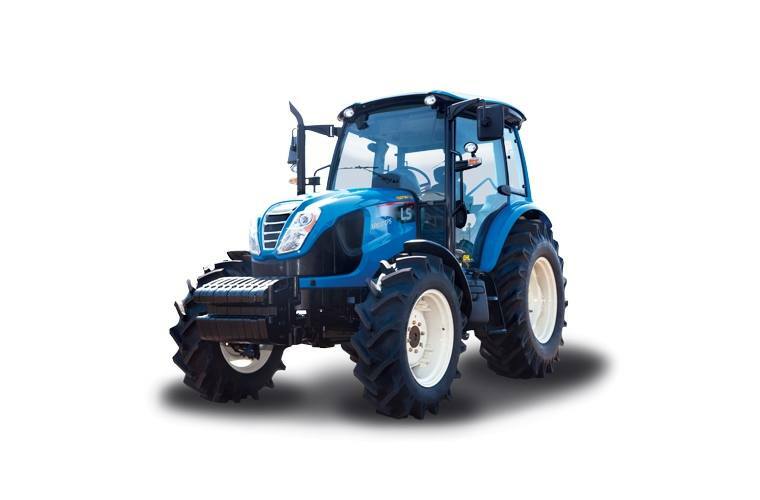 84HP and 101HP heavy duty 4WD utility tractors designed to take on tasks of medium-sized farms, hay operations and livestock ranches. Independent PTO: Easiest PTO to operate that can be turned on or off with a switch. Standard 540, 750, 1,000 RPM and shiftable ground speed PTO. 4WD (Front Wheel Mechanical Assist): Go from 2WD to 4WD with a simple push of a switch. Extendable Lower Links: With secondary Hydraulic Cylinder allows easier attachment of a wide variety of Category 2 implements with a 8,378 lb lift capacity. Standard Fully Synchronized Transmission & 40x40 Power Shuttle: Change gears without having to stop. 40 forward / 40 reverse gear transmission provides more operating speeds than others in its class for superior control, precision and safe operations for virtually any application. Includes creeper speed and hi/low button. Standard 3 Sets of Remote Valves with Detent: Adds functionality and improves ease of use by allowing attachment of hydraulically controlled implements without the high, additional costs like others in its class to add the remotes as options. -Point Hitch with Hydraulic Auto-Lift, Draft & Position Control: Most convenient way to operate your 3-Point Hitch. Large Fuel Tank: 30.4 gallon capacity provides long operation times. Tier 4 Engine: Eco friendly TIER 4 engine provides more horsepower with less fuel consumption and emissions. The pre-heat starting aid helps starting the engine all the way down to -4F. Premium Seat: The air suspension provides a comfortable ride. Swivel the seat up to 20 degrees to reduce the strain when looking rearward.